March 12, 2013 – The Minnesota Department of Agriculture (MDA) is alerting consumers to avoid feeding or handling two brands of poultry-based raw pet food after the MDA laboratory discovered Salmonella bacteria in routine sample tests. One of the affected products include Bravo! Raw Food Diet 2 lb. 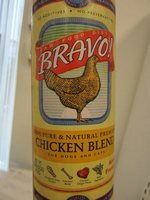 Chicken Blend for Dogs and Cats manufactured by Bravo!, LLC, of Manchester, Connecticut. This is a frozen pet food product with the production code of 06/14/12, which is located on the white tag on the end of the package. This advisory is for the 2 lb. size of Bravo! Chicken Blend with the “Best Used by Date” of 6/14/14 only. No other products, sizes, or production dates are involved. The FDA has confirmed the recall in a news bulletin last updated by the Agency on March 14, 2013. The recall is confirmed in this news release from the Bravo! website. For further information, consumers are invited to contact the company at 866-922-9222. 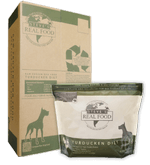 The other affected product includes Steve’s Real Food Turducken Canine Diet 8 ounce patties, manufactured by Steve’s Real Food, Inc., of Murray, Utah. This is a frozen pet food product with the “Use By Date” code of 10/27/13 B209, which is located on the lower front panel of package. There are no reports of human or animal illnesses associated with consumption of these products. People handling contaminated raw pet food can become infected with Salmonella, especially if they have not thoroughly washed their hands after having contact with surfaces exposed to this product. If left untreated, pets may be lethargic and have diarrhea or bloody diarrhea, fever and vomiting. Infected but otherwise healthy pets can be carriers and infect other animals or humans. If your pet has consumed this product and has these symptoms, please contact your veterinarian. Human symptoms of salmonellosis include diarrhea, abdominal pain and cramps and fever. Symptoms usually begin within 12 to 72 hours after exposure, but can begin up to a week after exposure. Salmonella infections usually resolve in 5-7 days, but approximately 20 percent of cases require hospitalization. In rare cases, Salmonella infection can lead to death, particularly in the elderly or those with weakened immune systems. Anyone who has become ill after handling this product should see their health care provider. Consumers are asked to discard any of these products they may have.